As you probably know by now, I love to bake. I am trying out some new muffin recipes as I was elected to bring in pastries for the teachers during teacher appreciation week at the kids' elementary school. I still love my blueberry muffins, but these are a close runner up! YUM! A woman at work made blueberry scones and orange marmalade butter for our birthday breakfast today. Nice way to start the day! 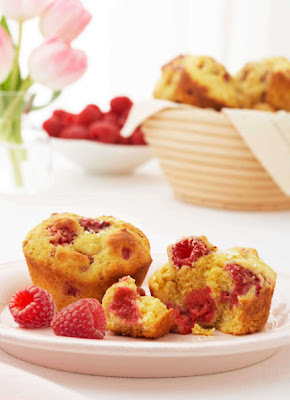 One of my favorite muffins is the Cranberry/orange muffin. MMMM! I will have to try this recipe! Oh my, I have already copied and pasted that recipe. I will be trying it very soon! Looks and sounds wonderful! MMMMmm! I have passed the recipe along to my brother-in-law, just in case I stop by for coffee. I have never had much luck with baking, but I do love to eat! Eating and junking is what I do best! Thanks for sharing. Yum! Anything with raspberries is always a favorite of mine. I picked up some fresh berries today so I can enjoy a muffin with my tea tomorrow. Can't wait. Okay, did you take that photo? It is fabulous! My daughter made these and added 1/2 cup pecan pieces and sprinkled a cinnamon-sugar mixture on top of each muffin before and after baking them. They were delicious! !